Notes: This article was submitted to Zentendo. 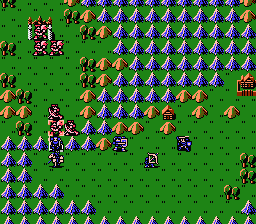 The first Fire Emblem game, Dark Dragon and Sword of Light was released in April 1990 in Japan. It was released for the Famicom (the Japanese NES) and was one of the first Strategy RPG games to be developed. Key figures involved in its production included Shouzou Kaga, the director and creator of the series, Yuka Tsujiyoko, who composed most of the series’s music, and Gunpei Yokoi, as its producer. Marth, the prince of a fallen country, was the hero of the game, and he also starred in Super Smash Bros. Melee. Following the success of the original was Fire Emblem Gaiden, also for the Famicom. The “Gaiden” part of the title refers to this game being a side story to the original. The story and setting were different from the original, as were the majority of the cast. Whilst the key gameplay was similar to the original, many elements of were changed and, as a result, some fans refer to Gaiden as the “black sheep” of the series. Additions such as movement on the world map and in towns, and the ability to repeat specific battle maps, led to a different game experience. The next and third game in the series, Mystery of the Emblem, was a direct sequel to the original. It was released for the Super Famicom (the Japanese SNES) and featured improved graphics and gameplay over the first two games. This game was actually two games in one, with a remake of the original included as “Book 1” and the actual new game being “Book 2”. 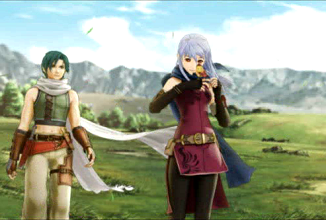 Many characters from the original returned, including Marth who again reprised the role of the hero. The story was adapted into an OAV, although only 2 episodes were released before its cancellation. game with Gunpei Yokoi as its producer. It is one of the most popular games in the series, and also one of the most different. The game began a brand new storyline, which was split into two halves or “generations”. Players could “breed” characters in the first generation to alter the attributes of the children characters in the second generation. The battles were also more large-scaled compared to other games. Not to be mistaken for a full game, Akaneia Saga was a series of four short games, or episodes, which could be downloaded for the Broadcast Satellaview add-on for the Super Famicom. The games used the Mystery of the Emblem engine and detailed scenarios that occurred chronologically before the beginning of Dark Dragon and Sword of Light. The dialogue was mostly voice-acted and was streamed online. The aim of the games was to rack up points, obtained mostly by defeating spawning enemies. 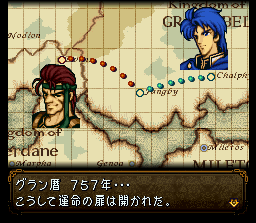 Although the Nintendo 64 was released at the time, the next game Thracia 776 was instead released for the Super Famicom. Originally it was only available by downloading onto an official memory cassette, but eventually it was released in cartridge form. The game was a “midquel” to Genealogy of the Holy War and was also the last Fire Emblem with Shouzou Kaga as its director. Thracia 776 was infamous for its unforgiving difficulty and gameplay; however it was also one of the most complex and complete games in the series. 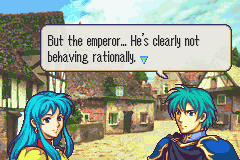 “Support” system featured, which allowed certain characters pairs to converse to obtain statistical bonuses (and extra character development). Roy, the hero of the game, appeared in Super Smash Bros. Melee (and before the release of this game). 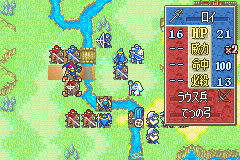 and featured Roy’s father, Eliwood, as one of the three heroes. For a change, players assumed the role of a “tactician” character in the story, and characters would often communicate directly with the player/tactician. An in-depth tutorial was included to familiarise newcomers to the series. Overall the game was well-executed and a worthy successor to Sword of Seals. 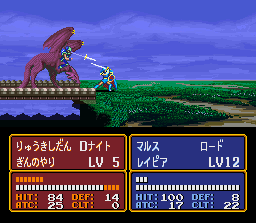 The Sacred Stones was the third game for the GameBoy Advance and the last game to use the Sword of Seals engine. It re-introduced many features last seen in Gaiden, such as world map movement. Features like two choices during class-change, and battles outside of the story, were popular amongst some fans. However this game was often criticised for being too easy and short compared to the other games in the series. “Skirmish” maps could be repeated to gain unlimited experience and the majority of the characters were overpowered compared to the enemies. Path of Radiance, released for the GameCube, moved the series back to the consoles and into the realm of 3D. It re-introduced some concepts from the last two SNES games, such as character Skills. New features included CG movies and a new race of shape-shifters. Opinions for this game were divided, mainly between “old-school” fans, who appreciated the similar feel to the SNES games, and recent fans that preferred the 2D look and portability of the handheld games. The main hero, Ike, also stars in Super Smash Bros. Brawl. The most recent release (at the time of this article) was Radiant Dawn, for the Wii. Despite being on the Wii, no special Wii features were used and, instead, the game played like a traditional Fire Emblem game. The game was a direct sequel to Path of Radiance and naturally improved on Path of Radiance in almost every aspect, although subtly. Transfer of Path of Radiance data featured, which could (slightly) enhance the attributes of returning characters. The game was also the longest Fire Emblem to date, spanning four parts, and featured the largest simultaneous character roster.